Acknowledge the contributions made by individuals and organisations to the wider UK glass industries (which include organisations using glass composites and optical fibre). Encourage innovative and novel developments in glass technology, manufacturing and processing and in pioneering the use of glass into new and challenging areas; for example aerospace, information and communication technology, medicine. 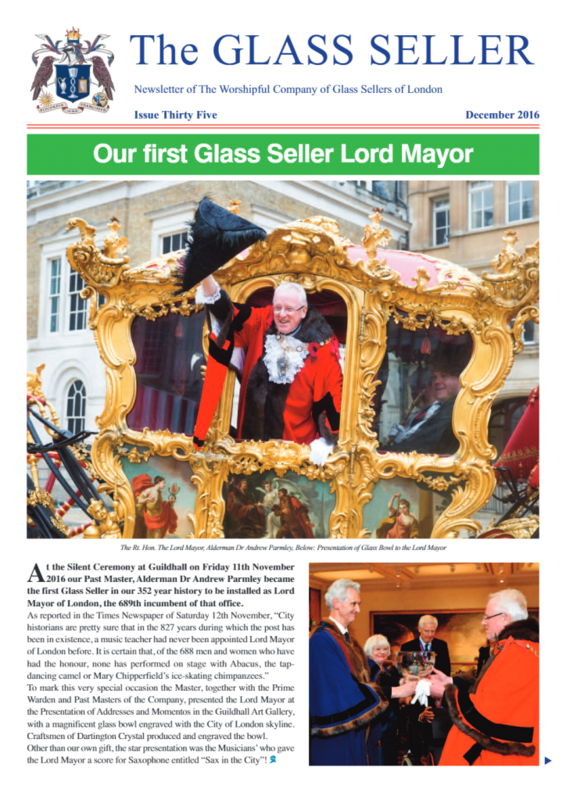 The Glass Sellers’ company has supported glass technology since its earliest days. In 1673 the Company employed George Ravenscroft to carry out research to find a process for the production of English glass. In 1674 “Lead Crystal” was born when he obtained a patent, from Charles II, for a glass with the desirable quality of a resemblance to rock crystal. Today glass is used in technology, communication, medical instruments and even the manufacture of cars, aircraft and yachts. Our involvement with the glass industry encompasses every sub sector and we are keen to be involved in developments in the wider glass industries in the 21st Century and beyond as demonstrated by some recent winners of our prize. 2008 GKN Aerospace: In recognition of their development of advanced carbon composite aircraft structures incorporating embedded sensors made from glass fibre that provide data about the forces experienced by the structures which can, in turn, help to improve aircraft safety and reduce maintenance costs. 2006 Joe Vittoria: For design and build of the largest single-masted yacht in the world from glass fibre. Mirabella V, is a 75 metre sailing Superyacht with over 3,000 square metres of sail and capable of taking 12 guests in luxurious accommodation anywhere in the world, with ultimate upwind sailing performance. The combination of flexibility, strength, light weight, economic construction and material costs, and durability in a hostile marine environment made glass fibre unique amongst the available fabrication materials. High Modulus, a composite design company based in the Hamble in Hampshire developed a scheme for the GRP hull which was approved by the Classification society Det Norske Veritas. VT Shipbuilding (formerly Vosper Thornycroft) was selected as builders who were at the leading edge of construction in GRP. It was to prove one of the most demanding technical challenges in nearly 150 years of VT shipbuilding history. 2001 Dr Kevin Sanderson, a research scientist with Pilkington plc: For his work on a coating which when applied to flat glass effects a self-cleaning process. For many years, the industry had sought solutions to dirt and other extraneous matter adhering to glass surfaces. The basis of the work by Dr Sanderson has been to use water friendly coatings and this has proved remarkably successful.